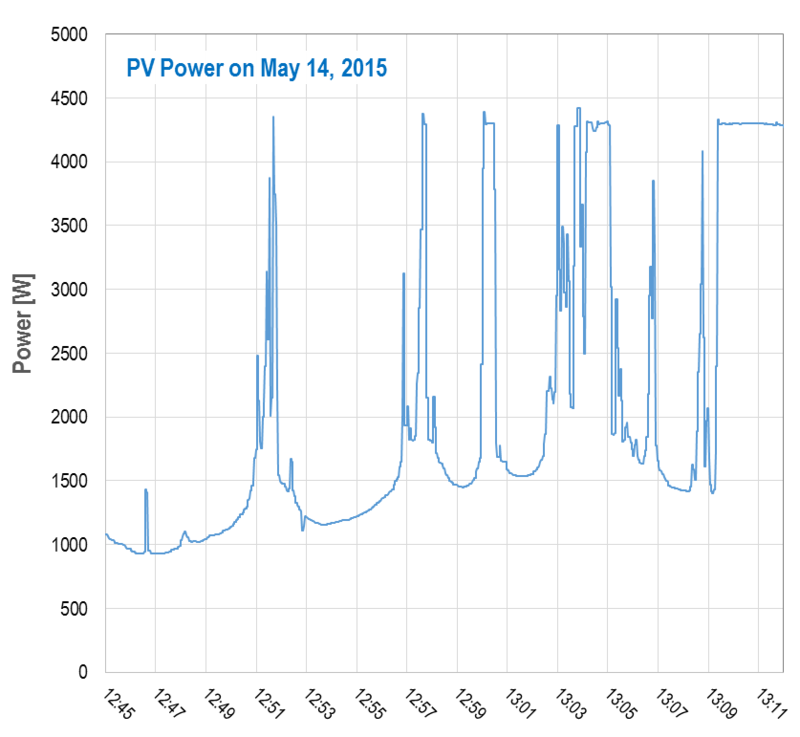 Solar Power: Some Data for the First Month. On May 4, 2015, we started up our photovoltaic generator. Here are some numbers and plots for the first month – and what I plan to do next. Our generator has a rated power of 4,77 kWp (kilowatt peak), one module has 265 Wp. The generator would deliver 4,77 kW of electrical power under so-called standard testing conditions: An irradiance of 1000 W/m2 of light from the sun, a module temperature of 25°C, and a standard spectrum of wavelengths determined by the thickness of the atmosphere light has to traverse (Air mass – AM 1,5, equivalent to sunlight hitting the earth at an angle of about 48° from the zenith). Positions of our PV panels on the roof. We aimed at using our 30° upper roof spaces most efficiently while staying below the ‘legal threshold’ of 5 kW, avoiding a more complicated procedure for obtaining a permit to install them. Total output power (AC) of the PV generator and input power (DC) for each string as a function of time for two days. 1) May 11 – maximum ambient air temperature 23°C. 2) June 5 – maximum ambient air temperature 30,5°C. The maximum intermittent power here was about 4,4 kW! Another explanation for the difference is local ‘focussing’ of radiation by specific configuration of clouds reflecting more radiation into one direction: Consider a cloudless region surrounded by clouds – a hole in the clouds so to speak. Then radiation from above might be reflected at the edges of that hole at a very shallow angle, so that at some place in the sunny spot below the power might be higher than if there were no clouds at all. Here is another article about this phenomenon. A PV expert told me that awareness of this effect changed best practices for sizing the inverter: From using one with a maximum power about 20% lower than the generator’s power a few years ago (as you hardly ever reach the rated power level with constant radiation) to one with matches the PV peak output better. 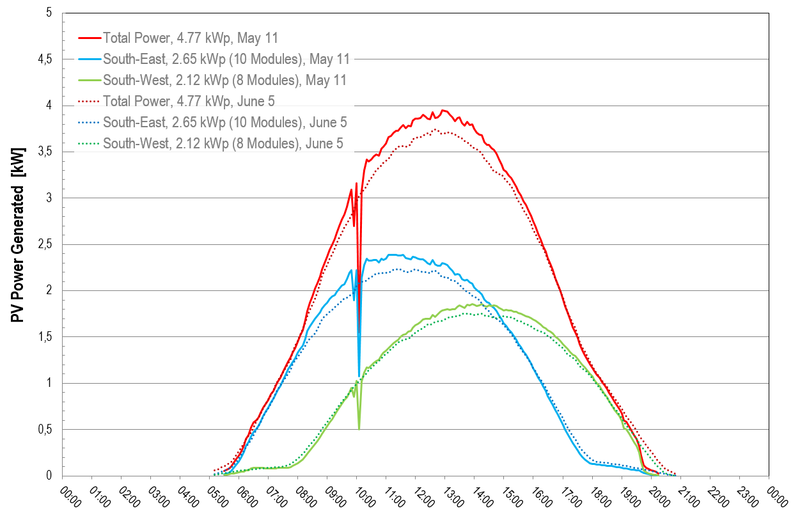 The figures from May 11 and June 5 also show that the total power is distributed more evenly throughout the day as if we would have had a ‘perfect’ roof oriented to the south. In the latter case the total energy output in a year would be higher, but we would not be able to consume as much power directly. But every kWh we can use immediately is worth 3 times a kWh we have to sell to the utility. The next step is to monitor the power we consume in the house with the same time resolution, in order to shift more loads to the sunny hours or to identify some suckers for energy. We use more than 7000 kWh per year; more than half of that is the heat pump’s input energy. Our remaining usage is below the statistical average in Austria (3700 kWh per 2-person household) as we already did some detective work to discover energy-sucking devices. Smart meters are to be rolled out in Austria in the next years, by 2020 95% of utilities’ clients should be equipped with them. These devices measure energy consumption in 15-minute intervals; they send the data to the utility daily (which runs a web portal where clients can access their data) but must also have a local interface for real-time logging given to clients on request. As a freshly minted owner of a PV generator I got a new ‘smart’ meter by the utility; but this device is just a temporary solution, not connected to the utility’s central system. It will be replaced by a meter from another vendor in a few years. Actually, in the past years we could read off the old analogue Ferraris meter and submit the number at the utility’s website. This new dumb smart meter, in contrast, requires somebody to visit us and read off the stored data once a year again, using its infrared interface. Our power distribution cabinet. The official (Siemens) smart meter is the rather large box to the left; our own smart meter with integrated data logger is is the small black one above it – the one with the wireless LAN antenna. The energy needed by appliances in the house and for hot water heating by the heat pump – 11 kWh per day: On average 56,5% in the first month come from the solar panels (self-sufficiency quota), and the rest was provided by the grid. The daily energy output of the solar generator was 23 kWh per day on average – either consumed in the house – this is the same cyan bar as in (1) – or fed into the grid. In this month we consumed 27% of the PV power directly (self-consumption quota). 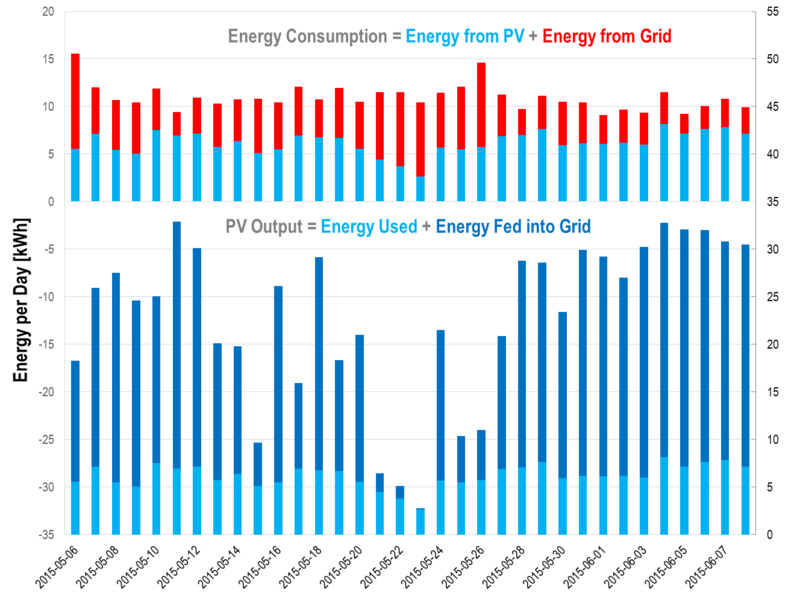 Daily energy balance: 1) The energy we consume in the house – partly from PV, partly from the grid (left axis) and 2) The energy harvested by the PV generator – party used directly, partly fed into the grid (right axis). [*] For German-speaking readers: I wrote a summary about different solutions for metering and logging in this case in this German article called ‘The Art of Metering’ – options are to use the official meter’s IR interface with yet another monitoring ‘server’, your own unrelated meter (as we did), a smart meter integrated with the inverter and using the inverter’s own data logging capabilities), or building and programming your own smart meter from scratch. This entry was posted in Control and IT, Heat Pump, punktwissen, Science and Technology and tagged Data Logging, Electrical Engineering, Electrical Power, Engineering, Measurement Data, Photovoltaics, Renewable Energy, Rooftop Solar, Smart Meter, Solar Energy, Solar Power by elkement. Bookmark the permalink. I’m backtracking and just noticed that even though I read this one on time I did not respond. Generally if I read on ether the phone or the nexus tablet I wait until I am on a PC before replying as my touch screen typing skills are sadly deficient. I’m awful, if fact. Wood – the only renewable energy allowing for saving summer’s solar energy for winter 🙂 – albeit with an efficiency lower than 1% … which does not matter if you have an abundance of it. I had no idea clouds affected solar power collection that way. It’s a good reminder that however superficially simple a thing might seem to be (“less clouds means more power”) there’re going to be surprising subtleties. Yes, photovoltaics is ‘weird’ in several aspects. Due to the way the current-voltage curve of connected solar cells works, a tiny shadow (such as by a smokestack or flag pole) can bring down the power the whole string. Excellent post. As we continue with our renovations, the goal is to reduce our gas and electricity consumption so that alternative energies will be viable choices for us, too. It’s so exciting! Thanks, Michelle! Yes, it is exciting! I enjoy the detective work, but I know I am overdoing it – trying to track down every kWh, like that radio clock that uses a few watt, or the rather old secondary Uninterruptable Power Supply for the computers that is charged continuously but hardly ever used…. It’s like house cleaning or inventory, which seems like sound practices. 🙂 But can you imagine yourself not doing all the research? It’s probably the thing that delights you the most! Did you look into storage systems? The straight-forward question in relation to this post 😉 – thanks, Howard! Yes, I looked long and hard into storage systems, long before Tesla’s announcements and after. Actually, this post had originally been much much longer, but then I cut out the battery-related part and saved it as a draft for a future post. Of course the last figure and the numbers are exactly what you need to estimate if a battery would be economical (plus an estimate of how they would change with a battery). So I risk that you will not read the next post and summarize: Even with batteries as cheap as Teslas’ will be (most likely – we only know the selling prices yet and we don’t yet the offerings in Europe yet), a storage system will hardly pay itself back within its life time – given our prices and costs of electricity, the size of our generator (a fairly typical one), typical battery capacities, and the expected raise in self-consumption quota when a battery would be added. In summer you have so much surplus of energy, so you have to sell it to the utility ‘unfortunately’. In winter, the small harvest of PV energy would be consumed immediately and the battery will be hardly charged. So the differences between the scenarios with and without battery are not as dramatic as one might expect, especially if you try to optimize as much as possible by load-shifting without a battery already. Since our power infrastructure is very reliable (downtime per client less than 1 hour per year on average) battery as part of a backup system is not that important for me. Thanks Elke. Here in the tropics the economics would be quite different, although we might start using the air conditioners during the day as well. I read almost all of your posts ! Yes – you could be nearly autonomous with storage systems if you don’t have to factor in heating in winter. I have seen a solution that even uses AC to ‘store’ solar energy for the night: By creating ice during the day that is then used in the night to cool the air before it enters the actual AC system so that you need less electrical power for the same cooling effect. That almost makes me want to invest in a solar panel or two. (might need more than 2). No need to connect to the house supply. This is one of those Alice-inWonderlandy ideas that could really work.